Garmin announced today the release of two new options to help you meet the 2020 ADS-B Out mandate. The GTX 345 and GTX 335 all-in-one transponders are compatible with ForeFlight and, depending on the model you choose, wirelessly deliver (via Bluetooth) FIS-B weather, ADS-B traffic, GPS position, and attitude information to your mobile device. We are thrilled to continue our partnership with Garmin and to offer ForeFlight customers flying with Garmin hardware the opportunity to unlock more value from their avionics investment and gain access to connectivity options that enhance the ForeFlight experience. Visit foreflight.com/connect to learn about all of the ForeFlight connectivity partnerships. Connect to the Stratus Wi-Fi network. 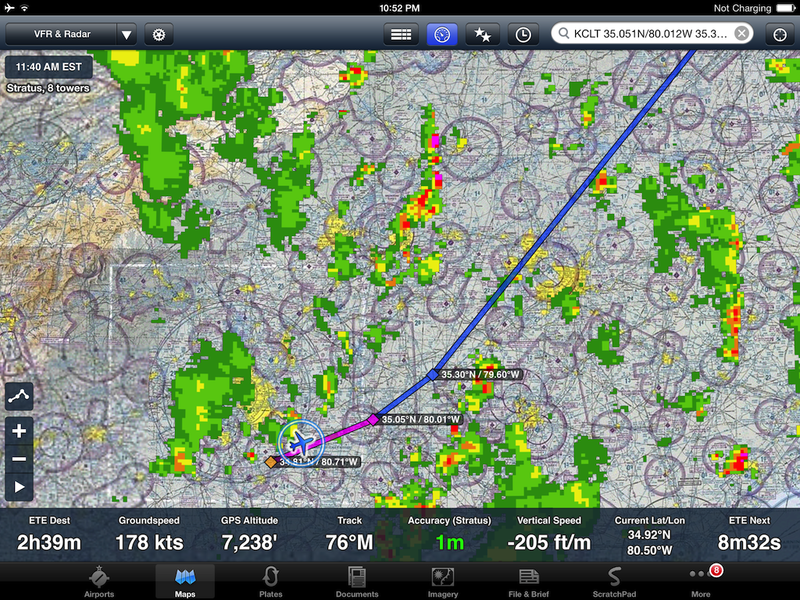 Navigate to More > Devices > Stratus inside ForeFlight. Tap the “Tap to Update” button next to the current firmware version. This update adds a new item to the Settings section of the Devices > Stratus view: Wi-Fi Settings. Tap on the item to see the new settings. Disabling SSID Broadcast hides your network’s name from devices trying to connect to it, so the only way someone can access the network is if they already know its name. Another new setting is the option to enable WPA2 Security, which allows you to set a passcode on the network. These settings make it harder for someone else to access your Stratus’ Wi-Fi network, though most pilots will probably not need this level of security. If you set a passcode but then forget it, you can perform a factory reset of the device by holding down the power button for 30 seconds. This will return the Wi-Fi Settings to their default states. Be warned, however, that a factory reset will also delete any Stratus logs saved on the device. We are excited to announce connectivity between ForeFlight Mobile and Garmin avionics. When connected to Garmin Flight Stream, you can now wirelessly receive ADS-B weather and traffic, precise GPS position data, and dynamic pitch and bank information on your iPad or iPhone. 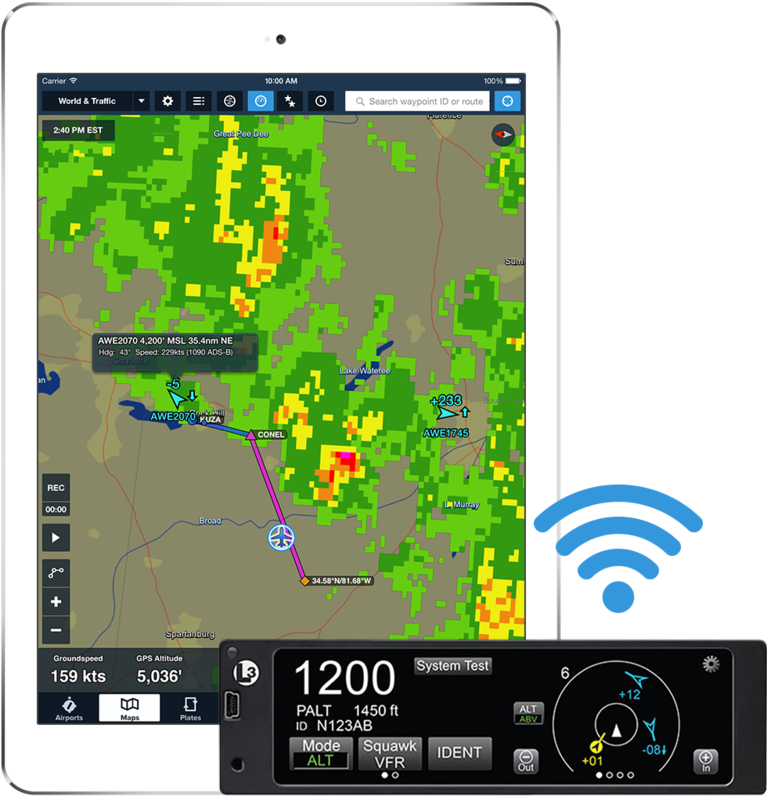 ForeFlight Mobile connects to compatible Garmin avionics via the Flight Stream 210/110, Garmin’s Bluetooth® wireless gateway, and displays the full suite of ADS-B weather and traffic information received from the GDL 88/84. The Flight Stream 210, with its internal attitude sensor, powers ForeFlight’s Synthetic Vision and adds a backup attitude capability with dynamic pitch and bank information. WAAS GPS position information from GTN™ 650/750, GNS™ 430W/530W navigators, or GDL 88 with an internal WAAS receiver can also be used to power features like ForeFlight Mobile’s moving map and geo-referenced approach plates and taxi diagrams to enhance situational awareness in the air and on the ground. Additionally, flight plan transfer capability is currently in development and will be available in a future app update. Support for Garmin Flight Stream connectivity is available with ForeFlight Mobile 7.2, now available for download on the App Store. For more information, visit foreflight.com/connect. Recently ForeFlight’s own Weather Scientist, Scott Dennstaedt, and Sporty’s John Zimmerman hosted a webinar devoted to Weather Flying and the iPad. In this hour long session, learn about the basics of weather, discover how to utilize ForeFlight and the Stratus ADS-B receiver for the most informed and effective weather decision-making, and see ForeFlight and Stratus in action with real-world scenarios. This webinar is geared towards making you a safer, more strategic, and informed pilot in any weather situation. We are off and running into 2014 with the first release of the year. ForeFlight Mobile 5.5.1 is now available for download at App Store and brings you animated in-flight ADS-B radar via Stratus. Animated ADS-B radar is available to both ForeFlight Mobile Standard and Pro subscribers with a first or second generation Stratus. 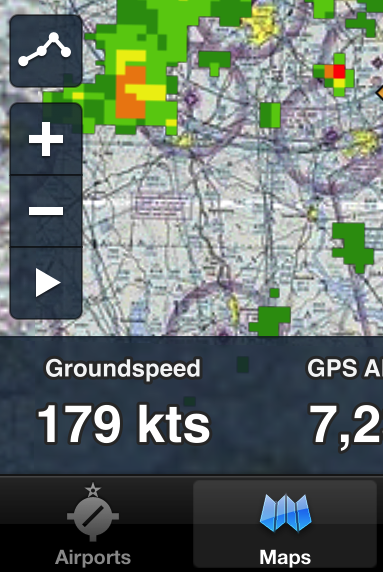 Please note that ADS-B weather (and Stratus) requires iPad 2 or newer or iPhone 4 or newer. In-flight animated ADS-B radar gives you another edge on situational awareness and informed decision making by providing strategic weather trending information. See if weather is building or dissipating, and the likely direction of travel. When Stratus is connected to your iPad or iPhone, select the radar overlay option in the Maps view. You will now see an animation play button in the lower left corner of the screen. The animated set will play up to five frames of contiguous NEXRAD updates. Nearby NEXRAD precipitation maps update every 5 minutes whereas radar data further away from your aircraft updates every 15 minutes. Also in 5.5.1, you will see a new zoom-to-route button above the Map view zoom control. A single tap re-centers your route in the Map view. As always, we are on frequency at team@foreflight.com to assist with any questions you may have about animated ADS-B radar. ForeFlight Mobile 5.5.1 is a free update for current subscribers. Click here for instructions on updating to the latest version. This is the first of a two-part series on traffic display within ForeFlight Mobile. This short video shows how to connect to Stratus, enable the traffic layer, and interact with a traffic target. December 27, 2013 NOTE: We have a short video (linked here) that shows how to connect ForeFlight Mobile to Stratus, enable the traffic layer, and interact with a traffic target. You can find out more about the ForeFlight Mobile and Stratus integration by clicking here. April 29, 2013 NOTE: ForeFlight Mobile was updated to show ADS-B traffic data (as of v5.1). ADS-B Out adoption has grown over the last year, but all of the cautions from this post still apply. Read on to learn about how the ADS-B traffic system works, and why having ADS-B Out installed in your airplane is critical to getting useful traffic data. Many pilots today – in our booth at Sun ‘n Fun and on Facebook and Twitter – have asked about whether or not the Stratus and ForeFlight Mobile support traffic. You’re flying along and an aircraft passes by. No alert. Another aircraft passes by, no alert. Then another, and another, and another. No alerts. Occasionally, you get an alert. But for the most part, day in and day out, traffic passes by, no alerts. In pretty short order, you lose confidence in your portable ADS-B “traffic” system. Without certified ADS-B “Out” equipment in your airplane, the narrative above is likely to be your experience if your aircraft is not ADS-B “Out” equipped. ADS-B ground stations only send out traffic information when a properly equipped aircraft “pings” the station. To ping, an aircraft needs certified ADS-B avionics installed that are permitted to ping, receive air-to-air traffic broadcasts, and send traffic information into the national airspace system computers. This ping ability is essentially enabled by what is referred to as “ADS-B Out”. Stratus is ADS-B In only, and does not provide ADS-B Out capability. In response to ADS-B Out pings, an ADS-B ground station sends back traffic data in a hockey puck-shaped area centered around the transmitting aircraft. Ground stations aren’t always broadcasting traffic data – they transmit that when an ADS-B Out signal is received. The “puck” sent is a customized set of traffic data – targets consisting of any aircraft transmitting ADS-B Out, Mode A/S/C, or targets being picked up by radar – observed within a 15nm radius of the ADS-B Out equipped aircraft’s current position (plus or minus 3,500′ in relative altitude). If your aircraft is not equipped to “ping” you would only receive traffic data centered around other ADS-B Out equipped aircraft that happened to be nearby. If you are on the fringe of that other aircraft’s puck, you’d be more than half blind. Since there are few aircraft currently equipped with ADS-B Out, this “blindness” would be a very common situation. Traffic on a portable ADS-B weather receiver creates a potentially dangerous false sense of security for pilots flying without ADS-B Out. They would not be seeing the whole traffic picture. As we get closer to 2020, ADS-B out adoption will grow. However, until ADS-B Out adoption is more widespread, ForeFlight Mobile will not be showing traffic data from the system to avoid this situation.